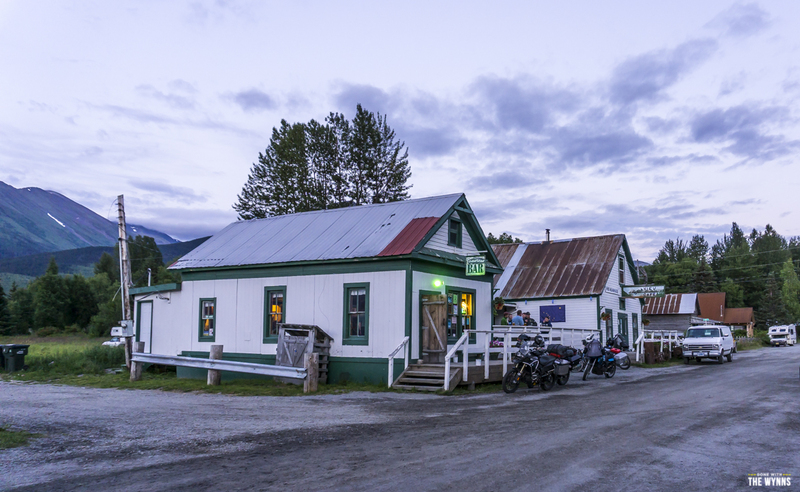 On the way to Seward, around the Turnagain Arm from Girdwood, sits the two tiny towns of Sunrise and Hope Alaska. There you’ll find unbelievable Alaskan Wild Camping and some of the best whitewater in the world. Sound enticing? This description from our local Alaskan friends had us chomping at the bit to kick off our Kenai Peninsula adventures. 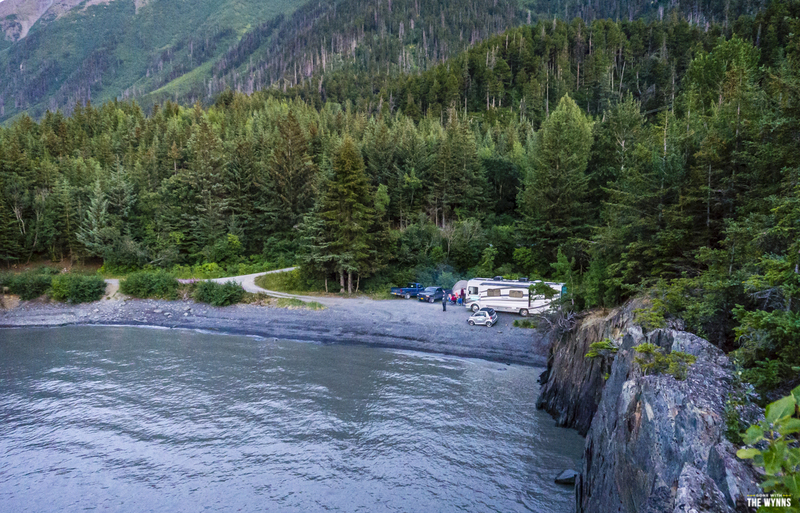 Driving south on the Seward Highway we hang a right at Mile Marker 70.7, just past the scenic Canyon Creek Bridge, and make our way north up the Hope Highway. The road winds through the Chugach National Forest for a total of 17 miles before it ends in Hope, Alaska. 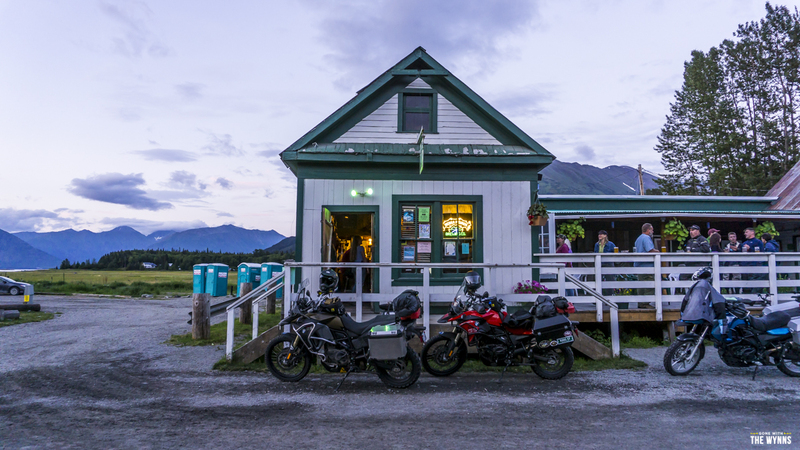 Unfortunately, like many Alaskan roads they just end, so this is a side trip that will cause you to backtrack, but we think it’s totally worth the extra fuel expense. Its past reads like many Alaskan ghost towns with tales of Boom, in fact it was the largest town in AK at one time, followed by a complete bust! From the Hope Highway there’s no sign of previous existence however there are remnants along Six Mile Creek that are now part of the National Register of Historic Places. We didn’t get to see the ruins ourselves, we were way too preoccupied with the adventure ahead! We’re in Sunrise for one reason: to raft some of the best whitewater in Alaska. The scenic gorge and its glacial water is maintained by the US Forest Service and they’ve granted only a couple adventure outfitters special permits to run this technical river. 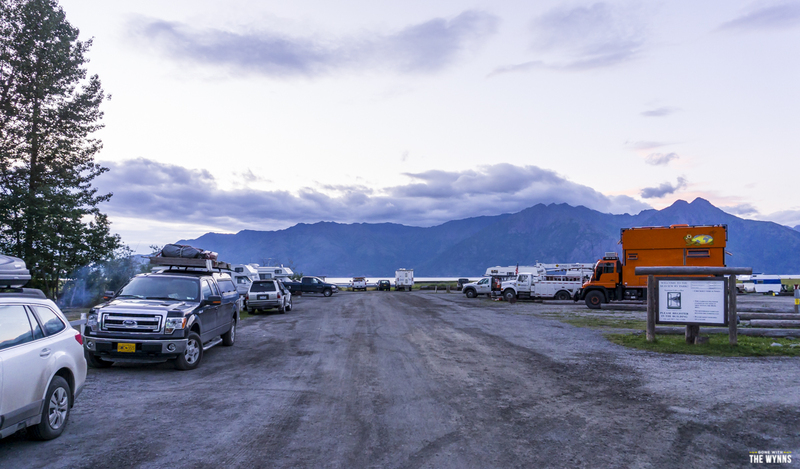 We chose Chugach Outdoor Center (at Mile Marker 7.5) for our adventure mainly because they said there’s plenty of room to park our rig and they have a hot tub for a most important post river warm-up! If you go ask for a guy named Mud Flap, he’s famous in these parts and his positive energy towards life is contagious. But be warned, he will shout “I love my life” a lot, but we just shouted it right back at him. 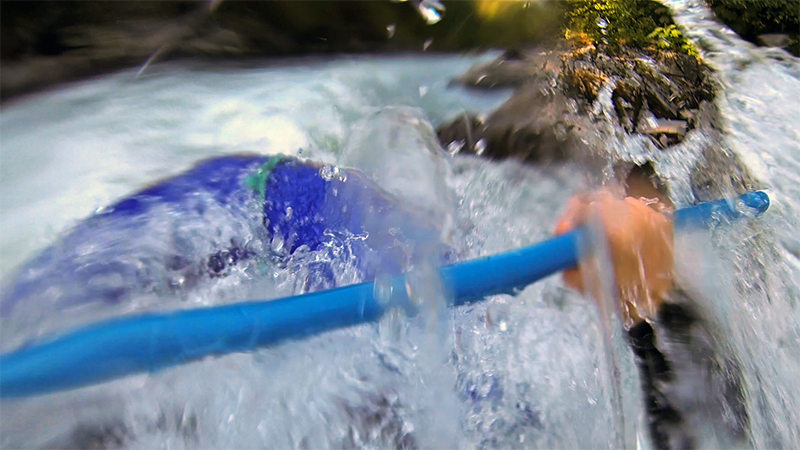 The trip down Six Mile Creek’s three canyons is filled with non-stop class IV and V rapids and is an absolute BLAST! We couldn’t stop smiling and “woo-hooing” the entire way. Oh yea, my mom joined us for this adventure! Check it out. There are several spots to pull off the road and camp along the Hope Highway but there’s a hidden pullout that is by far one of the most picturesque places to Wild Camp. In fact it’s so scenic I hesitate to recommend it because it’ll likely be shut down if it gets too much pressure from campers, especially the campers that leave their waste behind (we saw plenty of it). As a fellow traveler make sure you pack it in, pack it out and do everything in your power to leave no trace so others can continue to enjoy this beautiful location. There were other more secluded spots at this location to park but the locals hanging out invited us to join them for some board games and campfire fun…and we don’t typically turn down an invitation like that. There is something about camping that brings out the super friendly side of people. The turn-in can be accessed just before mile marker 13 and if you miss that turn in you can access the other end of the loop immediately past that same mile marker. There are a few spots on this short loop road but we camped at this exact location 60.929650, -149.543241 It is a secret camping spot for travelers as it’s not well documented online, or in the Milepost, but it’s a popular spot for locals and on the weekends the place can get filled up pretty quickly, so make sure you have a plan B.
It’s a Thursday and there’s an open mic night that draws characters from hundreds of miles away…and that’s all we knew about this little town. Sadly, we didn’t really film (or photograph) much here, but by the time we left we had fallen in love with it. Hope, AK has somehow endured the Gold Rush Boom and Bust, the 1964 Good Friday Earthquake and loads of other tragic events but somehow it’s survived, and I’d say from our experience, it thrives! Near Mile Marker 17 (close to the end of the Hope Highway) we turn right on Old Hope Road and quickly drive past all the cute restored historical buildings, the updated cottages, a little farm, a library, school, a few dilapidated shacks and each one just oozes with historic charm. The road dead ends into a parking lot/campground and people are everywhere! 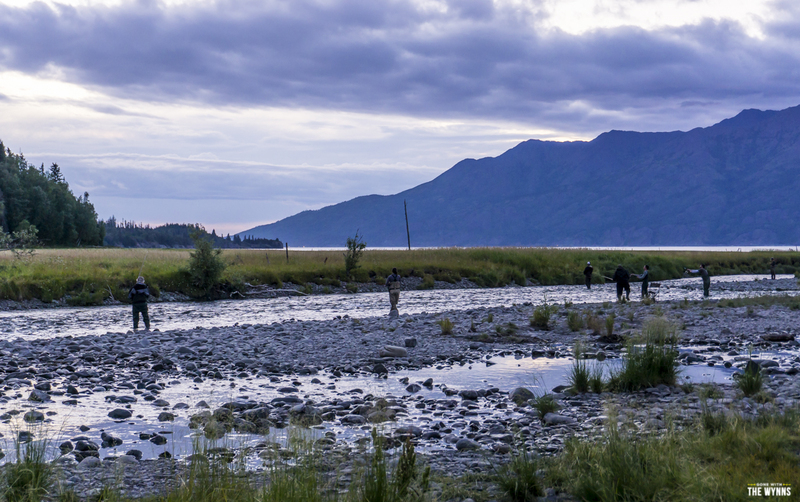 The creek is loaded with fishermen (and fisherwomen) catching salmon, the RV park is over half-full and there are cars lined up and down the road. On the west side of Main street there’s one large structure that houses the Seaview Bar and Seaview Café with a large patio connecting the two buildings, this is where all the “city” action is. We manage to score the last table in the café and as we sit down I gaze around the room, take in the mis-matched decor,the white board specials and prepare for a mediocre meal. The waitress quickly lays down menus and assures us everything is as local as possible and made with lots of love. Then the food arrives and BAM! 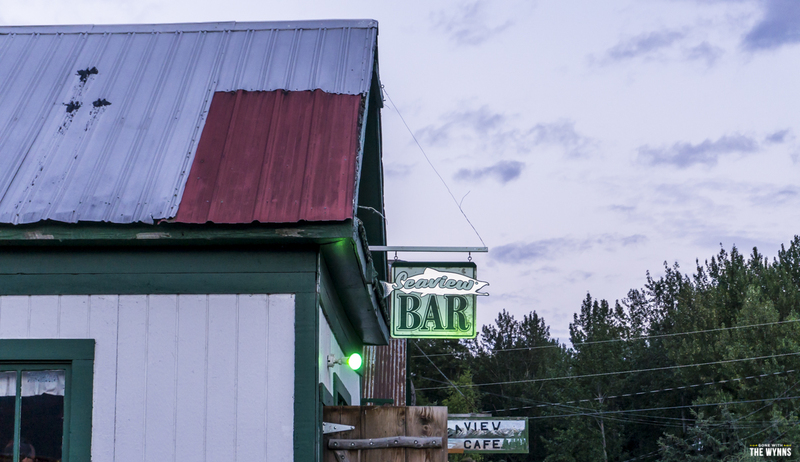 Cold local brews by the pitcher and some of the best fish n’ chips we’ve had in Alaska. After dinner we wander over to catch the end of the open mic night and let me tell you, this place is packed with the perfect mix of Alaskans, transplants, expats and tourists. I love this place! Tito’s Discovery Café – Apparently this is a local favorite for pizza, it came highly recommended by everyone we ran across. Sadly they have odd hours so they were closed the night we drove in for pizza. Surfing the Bore Tide – The incoming tide forms a wave and people get out there on surfboards and ride this “never ending” wave. 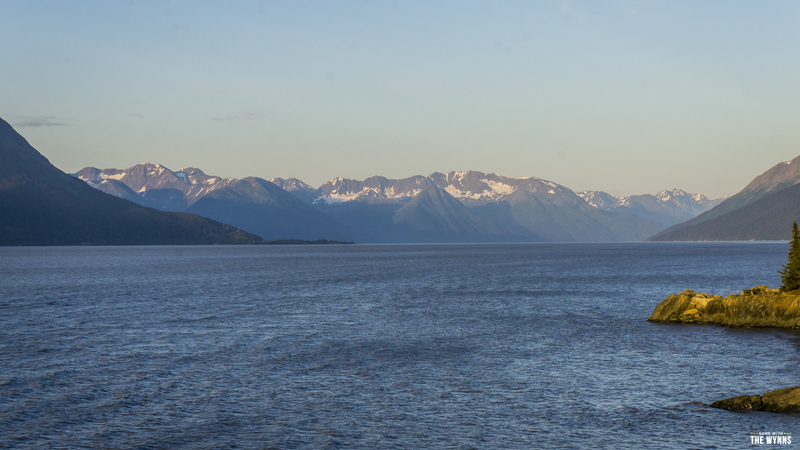 It’s extremely dangerous due to the muddy “quicksand-like” bottom of the Turnagain Arm so we wouldn’t have tried it ourselves (our surfing skills aren’t there yet), but it happens daily and we somehow missed seeing the action every time. Hiking – There are a few trails near Hope that seemed like must do’s but there’s only so much time and so many adventures you can stuff into one road trip. 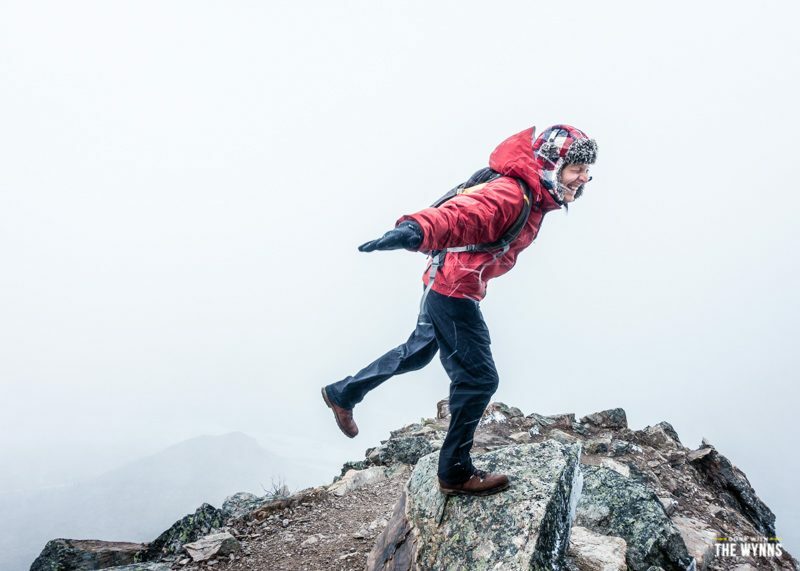 Hope Point – Ascends steep inclines with killer views of the Turnagain Arm, surrounding mountains & towns. Twin Lakes – A zig-zag trail up the mountains with waterfalls and glacial lakes at the top. 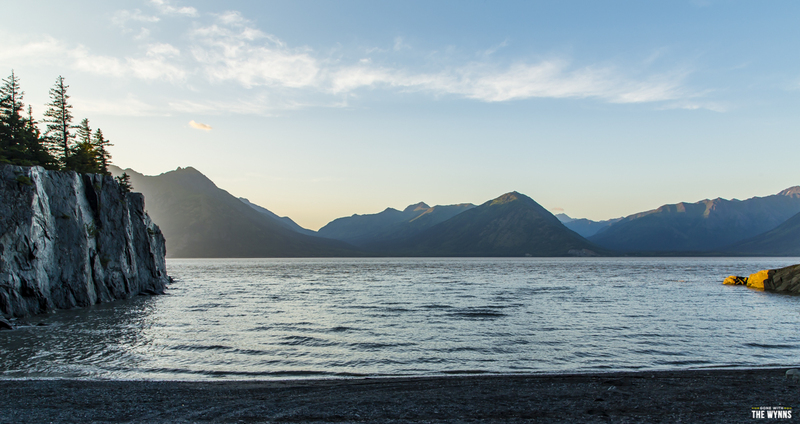 Gull Rock Trail – Scenic views of Turnagain Arm with ruins of a 1920’s sawmill. 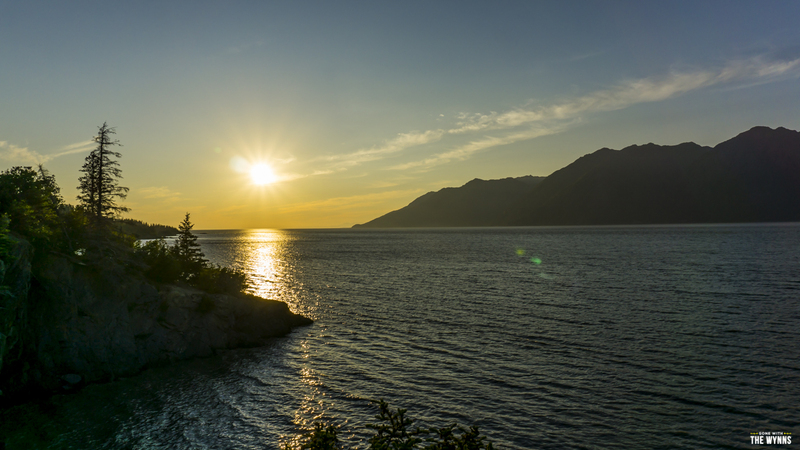 If you’ve spent time in Hope Alaska go ahead and rub it in using the comments below. If you’ve braved the whitewater of Six Mile Creek or any other frigid Alaskan waterways let us know your experience. Sharing is good karma and helps out those heading there next! Fuel Prices – There are fueling options but you’re better off filling up in Anchorage (80 miles north) or Seward (70 miles south). Road Conditions – The Hope Highway is less than 20 miles long and it was perfectly paved when we visited. Weather – Absolutely Perfect! Highs in the mid 70’s with lows hovering right at 50 and no rain! Resources – If you’re hittin’ the whitewater you’ll want a thin wool baselayer for your top & bottom and a thick fleece baselayer too. If you’re gonna stay in Hope then some good river fishing gear would be helpful if you wanna join in on the salmon fishing. Stayed at Porcupine Creek Campground at the end of the road last weekend. The hike to Gull Rock was wonderful! Hi Wynns, we really enjoy your stuff! Well, I went back and watched the video again. Not sure how I missed you slapping me back down in the video the first time. Didn’t I slap your leg to keep you from going over?? I hope so because if not, I’m losing it! I like everything you have shared on your Alaska trip, so much so I want to check it out. 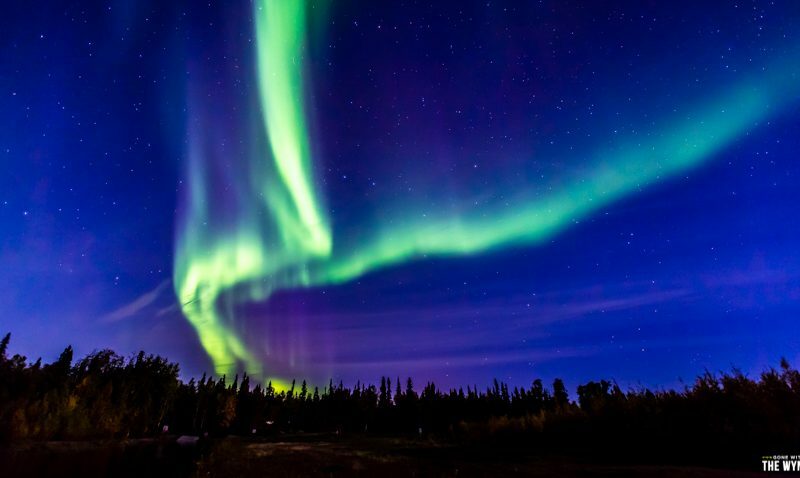 Previously, I was not inspired to go because all I’ve ever seen on Alaska are the typical (limited) cruise travel packages and the thought of exploring it by land seemed impossible, the forbidden wildernes and preparation to deal with it. Thanks for showing the possibilities! Hey Jason, your mom gets mega points! Beautiful area indeed!!!! I concur on both the fish & chips and colorful mix of people (including ourselves) at the bar in Hope. I loved seeing the rows of fishing on the bank of the river! I only wish I would have been on the white water trip with you all!!! I can tell you this-it would have been me going for the swim!!! AS I RECALL, it was Jason who almost fell out of the boat. I’m pretty sure I remember slapping his leg down when he was going over. Help me out here guys… (I guess that could have been in the Grand Canyon on the Colorado River but I DO think it was Jason. That was a fun trip. I love celebrating your birthday ’cause it usually revolves around water, paddling and a few good beers. Good memories – we just remember them differently. Haha! Love Hope Alaska. Glad you were able to go there. Your pics of it are great and it brings back fond memories. OMG, your video of that river run is one of the best I have ever seen. I mean really great. Kudos. What a wonderful trip you’ve had. We love your vids and blog. Just happened to notice that giant, orange GXV Perky Mog there in the last photo and wondered if you struck up a conversation with them and got to see inside? Those are pretty cool vehicles for overlanding/off-roading. And I must say, you guys do pretty darn well for wild camping yourselves. I imagine getting in some of the spots you’ve found isn’t always easy, but you’ve really been to some beautiful places in the middle of nowhere with your rig. Keep up the great adventure! We did get the chance to camp with and hang out with the Perky Mog crew and they were both fantastic and their rig is a thing of beauty! You can follow them on instagram, they post a lot and are fun to follow. Hey, I’ve been to Hope! Great little town, and it’s worth the time to make the detour off the main drag. Love the orange Unimog camper in the bottom picture. I see that you are near Eugene. Don’t know what your plans are, or how much time you have before your next destination. But the town of Bend has some very excellent breweries. Just giving you something to think about. I love what you guys do! Who cares where the money comes from I just hope it is not Oil.